After 11 hours of three-handed play the heads-up battle between Greg Merson and Jesse Sylvia needed only 17 hands to crown the 2012 World Series of Poker Main Event Champion… Maryland native Greg Merson. Merson’s victory was worth over $8.5 million, as well as winning the WSOP Main Event and the WSOP Player of the Year award, making Greg the first person to pull-off the rare double. This was also Merson’s second bracelet in 2012, and second seven-figure score of the 2012 WSOP tournament series. The marathon final table of the 2012 Main Event needed over 400 hands to determine the winner, including three-handed play that lasted longer than some final tables, and in the end it came down to a battle between the two odds-on-favorites heading into the final table. Merson and Sylvia topped the leader-board for most of the final table, with third-place finisher Jacob Balsiger the only other player to vault to the top of the leader-board, and that was only monetarily during three-handed play. After 12 hours of careful play the final hand of the 2012 WSOP Main Event came down to a light four-bet by Merson (with K5s) and a light call by Jesse Sylvia (with QJs); the board ran out with all small cards and Greg Merson became the 2012 WSOP Champion with King-high. Both men played at a very high level and both deserved to finish one-two. 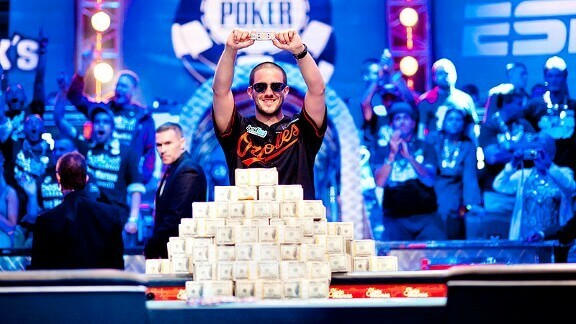 Congratulations to both Jesse Sylvia and 2012 WSOP Main Event Champion Greg Merson. The 2012 WSOP Main Event was considered to be “unremarkable” leading up to the final table, but the marathon 12-hour session that marked three-handed play changed all of that, and now the 2012 Main Event will likely be called “Merson’s Marathon” –or some other far wittier title than I can come up with right now—and will be the final table all others are judged by in terms of length. With the Player of the Year award set (sorry Phil Hellmuth, who finished second for the second straight year and third time overall) and the Main Event Champion crowned, the only remaining question from the 2012 WSOP is what kind of WSOP Champion will Greg Merson be? The recent track record of Main Event winners hasn’t been stellar, but Merson is definitely a skillful player, with a terrific story to go along with his poker skills.